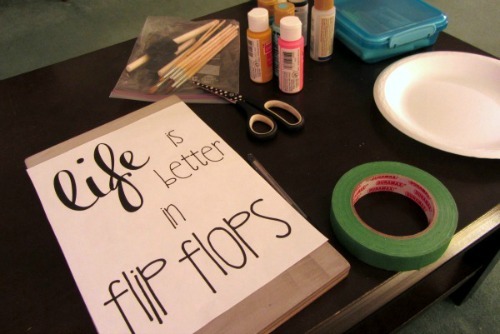 Ah... flip flops. One of the things I look forward to the most out here in Canada when the warm weather comes! Back when I lived in California I could pretty much wear them all year long! But... here in Canada, .. ya, not so much. So I really wear the heck out of my flip flops during the few short warm months we have! 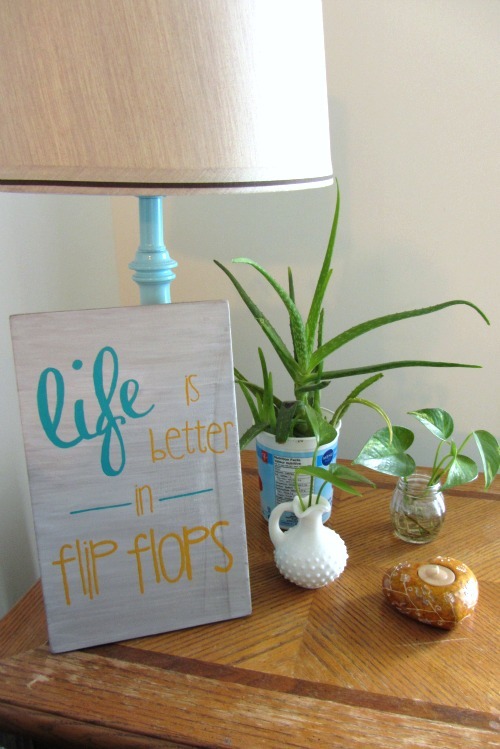 To further express my love for flip flops I made a cute little sign to decorate my living room. Yes, I painted another piece of scrap wood! If you didn't see the first one I made a couple weeks ago, you can see it here. This time I took photos while I crafted this one. So I thought I'd do another tutorial cause, well, let's be honest, tutorials are so much more exciting when there are photos to go along with the instructions. I first sanded all the edges, corners, and the top surface real smooth. With a sponge brush, I painted the top and sides with a layer of watered down brown acrylic craft paint and a drop of black craft paint mixed with that to make a darker shade of brown. Then I wanted to give it some sort of aged or sanded sketchy look, so I watered down (not too much) some white craft paint and did two to three coats of that. I like how the dark shows through the white a little bit. 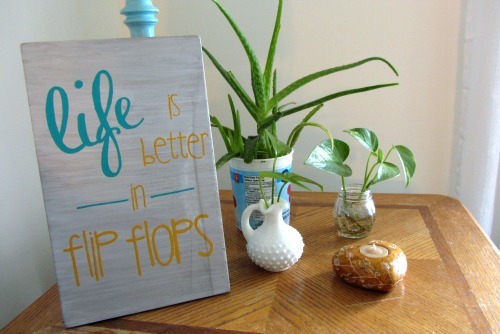 Looks kind of beachy like... which is perfect for this quote! I free handed the words on my last wooden sign, but this time I created a Word document, making sure to size everything to fit. I got my ideas for the layout from searching that quote on Pinterest. 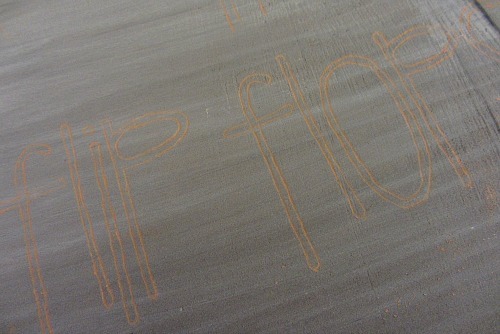 Flipping the printed paper over, I rubbed a piece of chalk all over where the words were placed on the other side. Because my board was painted with white, I used a bolder/brighter color. After making sure all the backs of the words are covered in chalk, I flipped my piece of paper back over, placing it where I wanted it on the board, the words now facing up. I used some painter's tape to keep it in place. Now you are ready to trace all the words! Just grab a pen and trace and outline all of the letters. Once you're done tracing and you remove the paper, you get this! Chalk lines on your board that are now ready to be filled in with paint! 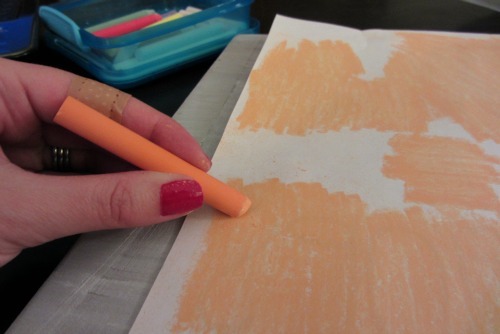 Super easy and neato trick for transferring words or shapes onto something for painting! I found all my skinny little paint brushes at the dollar store! They work great! 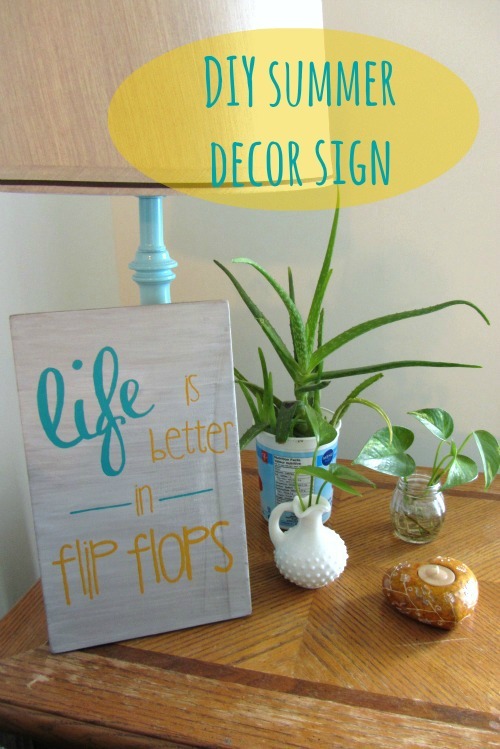 And now I have an adorable new summer decor sign! The perfect craft for a lazy Saturday afternoon. I actually find these painting projects very relaxing. The mustard yellow is a little hard to see until you come closer. But it looks great in the photos! And at least it will make me happy since I sit near this spot often! Hmmm.. I have one more piece of scrap wood.. what should I paint next?! 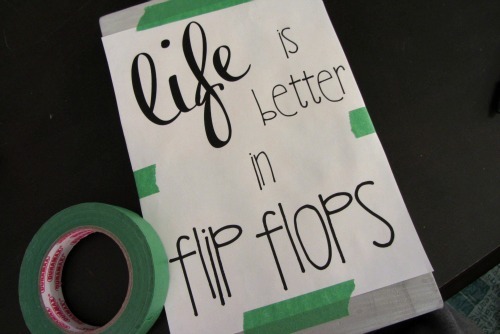 I Love the flip flop font - may I ask what font it is? Hi Aimee :) Thank you for your comment. My goodness, this was so long ago that I made this sign or even blogged on this blog! I don't even know what font it was now!! :/ Sorry! !